The town of Colchester is in the County of Essex, 50 miles (80 km) north-east of London. It is less than 30 miles away from Stansted Airport and 17 miles from the passenger ferry port of Harwich. There are several ways of travelling to Colchester. 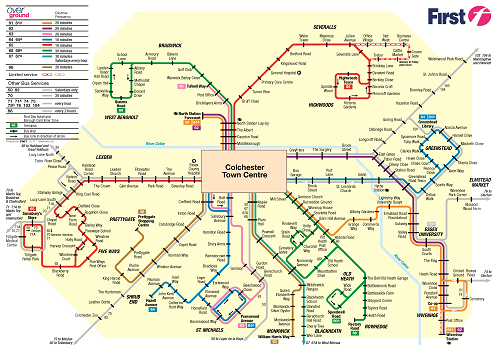 The nearest airport to Colchester is Stansted, one of London airports (location). If you use Stansted, take coach 133 to Colchester (timetable), it will bring you to the University campus, while going through town centre as well. You can book a ticket online (£12 single, £15 return) or buy one just before boarding (might be more expensive). If you use any other London airport, you will have to make your way to London Liverpool Street train station and take a train to Colchester. Express train services are available from Heathrow airport to Paddington train station, from Gatwick airport to Victoria train station and from Luton airport to Kings Cross train station. From any of these, use Underground to get to London Liverpool Street train station. If you plan to arrive to a non-London airport and need advice on how to get to Colchester, please don’t hesitate to ask us. There are frequent trains from London Liverpool Street station to Colchester North station. Colchester Town station is closer to town centre and to the University, but there are fewer trains going there. Wivenhoe station might be a destination only if you are going to Wivenhoe House – do not go to Wivenhoe if you are heading to a hotel in Colchester town centre. There are also train connections to Ipswich, Norwich, Felixstowe, Harwich and more – see National Rail train timetables and fares. Colchester is just off the A12. From London and south Essex, take the Colchester (A133) exit. From Ipswich, take the Colchester (A1232) exit. Please follow the signs to Colchester Campus, which is to the east of Colchester off the A133. A ferry service operates from the Hook of Holland in the western Netherlands to Harwich International Port, which is just 17 miles away from Colchester via A120. Train service to Colchester is also available. Each stop is about 10 min walk from Wivenhoe House. If you use a taxi, it is less than 4 miles from the town centre and should take about 10 min. Another useful source of information about buses in Colchester may be found here. We recommend using Google Maps as follows (Chrome browser only): if you point to a bus stop symbol on the map, and then click on it, a live time table of different busses coming to the stop within the next few minutes would be displayed. You would then have an option to send the timetable to your mobile phone or tablet.